Ever since we had the mussels in Fore Street restaurant in Portland, Maine, I've been dying to reproduce them at home. I ran by the New Deal fish market in Cambridge today and Carl gave me some lovely wild mussels. Since the restaurants always advertise PEI (Prince Edward Island) mussels, I asked Carl about them. He said that those are cultivated and easier to clean, but the ones he had that day were wild and more flavorful. I soaked them in a salty solution (1/2 cup kosher salt and 1/2 cup corn meal per 1 quart water) for a few hours in the fridge -- a trick I learned from James Peterson's Fish book. This creates an environment similar to their natural habitat and makes them filter out the sand if they are holding any. Then I yanked out the beards, scrubbed and rinsed the mussels and steamed them the usual way. The Fore Street addition were the almonds. I know that almonds and mussels sound like a wacky combination, but they are amazingly good together. Carl was right as always. These mussels were briny and sweet. But as much as I like mussels, I can't deny that the best part of any mussel dish is the steaming liquid. And where would the steaming liquid be without the bread? Well, was I lucky today or what. Jason made another batch of baguettes and these were not only the best baguettes he's ever made, but the best baguette I've ever had in Boston. Perfectly brittle crust, chewy and airy interior, and look at those holes! With some crispy potatoes, this was an awesome meal. Saute shallots in oil in a large heavy pot over medium heat stirring occasionally until tender, 4-5 minutes. Add garlic and almonds and saute until fragrant, 1-2 minutes. Pour in the wine and water, turn up the heat to high, and bring to a boil. Add the mussels, cover, and steam just until mussels open, about 5 minutes. Remove mussels to warm serving bowl, discarding unopened ones. I have cooked something similiar but never with almonds. Is it whole almonds that you've chopped up? Or can you make do with sliced? This is a more spicy SE Asian flair. I like it with lemon grass, garlic, chile, Thai Basil and a splash of fish sauce. Yum. Or just steam them plain and dip it in a nuoc cham (fish sauce, lime juice, and sugar with finely chopped garlic & bird chiles). I have another question -- I just cleaned some mussels and threw half of them away. Is it a myth or truth that if they are not tightly closed while raw, you should avoid eating them? It's sometimes close, and i don't know if they're just lazy, or actually bad. There are as many opinions on how to cook mussels as there are cooks, but here is what I do based on some tips from fishmongers. Soak mussels in salty water before cooking them (see the post for more details). Corn meal is optional. This creates and environment similar to their natural habitat and will help most of them to close taking some of the guesswork out of it. If they are just a little bit opened (1-2mm), I cook them anyway. Whatever mussels didn't open at least 1/2 inches wide after cooking I discard. If they opened during cooking, that means they were alive when you cooked them, which is a good thing. I'm sure the mussels were good, but they don't sound quite like the ones at Fore Street, which are wood-oven roasted in garlic and almond butter with a little vermouth. I don't think a wood burning oven is an option in my condo, but thanks for the vermouth and almond butter tips. Doesn't have to be wood-fired, but oven-roasting does make a difference. Would you mind sharing how to oven roast mussels? Roasting is usually a dry technique, but I've never seen mussels cooked without some liquid. By the way, are you from Portland, ME or did you go to Fore Street on vacation? I hope my post didn't seem snarky--wasn't intended that way. If you watch the line chefs at Fore Street prepare the mussels they just dump them in a skillet, add an ice-cream scoop or two of almond garlic butter (I know, not exactly low-fat), splash a small amount of vermouth in, and then stick the skillet into the wood oven. You can cut down on the butter (softened butter, chopped shallots and chopped roasted almonds) without disasterous results. The oven should be quite hot--450 to 500 degrees. Put the mussels and butter and vermouth in the pan and slide it into the oven; shake the pan every few minutes to make sure everything gets distributed. After 8 to 10 minutes you should be done-- just make sure all mussels are open. The mussels release a fair amount of liquid as they cook. There's usually enough broth that you can toss the mussels with some linguine, if you like, and maybe add some chopped parsely. I love Fore Street and have spent hours watching the line cooks in that huge open kitchen--better than a floor show! Your comments were not snarky at all :) I love comments like that because I actually learn something vs. when people just say "oh, that looks delicious." Your explanation was great. I now get what it means to over roast them. Do you know if they cover the pan? I guess in the oven, they might not need to because there is enough ambient heat. I'll try it next time I make mussels. One more thing: the last time I bought mussels (maybe three weeks ago) they seemed too large and chewy. Is there a season for mussels? I know they're farmed year 'round, but maybe a certain time of year is better than others. Thanks for the Fore St. mussels link. About timing: I do mine on the stove top. Maybe in the oven they take longer? TM, about types of mussels. There are definitely different types, like Prince Edward Island mussels, wild Maine mussels, etc. I don't cook mussels that much, so I am not sure what the difference in taste is. Try asking your fishmonger. I believe that Carl from New Deal Fish market in Cambridge told me that he prefers wild Maine. delighted to read your recipe, will try it as soon as my gas has been reconnected (there was a leak, have to wait a few days for the repair). 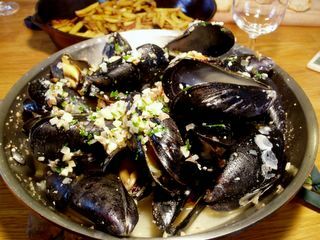 One cooment on the title: Moules Frites means Fried Mussels.